Play suspended because of darkness with 60 players still to finish their round. Andy Sullivan took the clubhouse lead at the Abu Dhabi Championship on 10 under as bad light cut short the second round with 60 players still to finish. Sullivan began with three birdies in a row and ended the same way for a 67. First-round leader Bryson DeChambeau only made it to the turn, while Rory McIlroy, Ricky Fowler and Jordan Spieth reached the 13th. DeChambeau is one off the pace, McIlroy and Fowler are five back and Speith is seven in arrears. The start of play was delayed by two hours and 45 minutes because of thick fog, and the second round will be completed on Saturday, when the third round will also be played. It was a frustrating day for Northern Ireland's McIlroy, who carded 12 pars and a bogey, with the latter coming at the ninth when he pushed his drive into rocks on the edge of a lake. World number one Spieth bogeyed the fourth and fifth, but birdied the 10th to ease concerns about missing the cut in his first regular European Tour event. Sullivan, a former shelf-stacker from Nuneaton, is looking to play himself into Darren Clarke's Europe team for the Ryder Cup later this year. The 29-year-old won all three of the matches he played under Clarke's captaincy in Malaysia last week, as Europe beat Asia to win the EurAsia Cup. 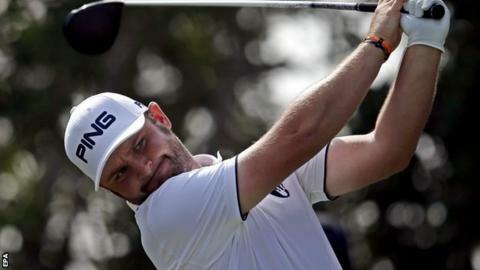 He is fourth in the European qualification standings, which will be enough for a Ryder Cup place if he stays there. He said: "I got off to a flying start but to dig deep and finish the way I did after struggling for four or five holes puts me in good stead for the rest of the tournament. "I've used that momentum from last week and that was just a little taster of what the Ryder Cup would be like. That's going to be 10-fold. Last week gave me more desire to put my name in the mix."